I always love it when we have new Sandylion stickers because it means I get to do one of my favourite things – creating Disney scrapbooking layouts. They are a great excuse for playing with bright colours and fun stickers. 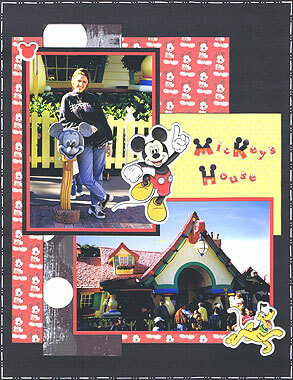 In this layout, I have used our brand new Mickey Mouse stickers to embellish my Disney World photos. I just love these foam stickers. They really pop out from your page. Materials Used: Black cardstock, Sandylion Mickey Poses paper, Junkitz Basics Circle Black paper, Beary Patch Sunbeary Dot paper, red cardstock, black ink, a white pen, Disneyland Alphabet stickers and Sandylion Mickey Mouse Foam stickers. 1. Cut a piece of black cardstock measuring 21.6cm by 28cm. This will be your background. 2. Use a white pen to draw a border around the edges of your black cardstock. I have used a combination of dots and dashes, but you can draw whatever type of border you wish. 3. Cut a piece of Sandylion Mickey Poses paper measuring 16cm by 22.5cm. Lightly ink the edges with black ink. When dry, glue to the left side of your page approximately 0.8cm from the left edge and 2.7cm from the top edge. 4. Cut a piece of Junkitz Basics Circle Black paper measuring 5.8cm by 24.4cm. Lightly ink the edges with black ink. When dry, glue down the left side of your page approximately 3.2cm from the left edge and 1.7cm from the top edge. 5. Cut a piece of Beary Patch Sunbeary Dot paper measuring 10cm by 9cm. Lightly ink the edges with black ink. When dry, glue on the right side of your page approximately 0.8cm from the right edge and 8.3cm from the top edge. 6. Mat a horizontal 4×6 photo with red cardstock and glue to your page approximately 1.5cm from the right edge and 3.3cm from the bottom edge. 7. 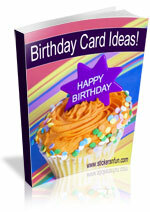 Crop a vertical 4×6 photo so it is approximately 9cm by 12.5cm. Mat with red cardstock and again with black cardstock. Glue to your page approximately 1.6cm from the left edge and 3.5cm from the top edge. 8. Select three foam stickers (I have used Mickey Mouse, Pluto and red Mickey ears) and position around your page, as shown above. 9. Finish off your page by using alphabet stickers of your choice to write your title in the remaining space on your yellow paper. You now have a cheerful Disney scrapbooking page using Mickey Mouse stickers that can’t help but make you smile. I’d love to hear your thoughts and ideas for using Mickey Mouse stickers on your layouts and what you think of this page. Please leave a comment in the comments box below. This entry was posted on Tuesday, March 8th, 2011 at 7:47 pm	and is filed under Disney, Scrapbooking Stickers. You can follow any responses to this entry through the RSS 2.0 feed. You can leave a response, or trackback from your own site.